Nicotinic acetylcholine receptors have been shown in many studies to be critically involved in memory function. The precise roles these receptors play depend on the receptor subtype, their anatomic localization, their interactions with other parts of the neural systems underlying cognition and the particular domain of cognitive function. Nicotinic agonists can significantly improve learning, memory, and attention. Nicotinic receptors in the hippocampus are innervated by cholinergic projections from the medial septum and diagonal band. Local infusions of either α7 or α4β2 nicotinic antagonists into either the dorsal or ventral hippocampus produce amnestic effects in rats navigating about a radial arm maze. There is cholinergic innervation of nicotinic receptors in other components of the limbic system as well. In the basolateral amygdala and the anterior thalamus, similar amnestic effects of nicotinic α7 and α4β2 antagonists are seen. Interestingly, there are no additive amnestic effects observed in these limbic areas when α7 and α4β2 receptor antagonists are combined. The particular expression patterns of α7 and α4β2 nicotinic receptors in these limbic and cortical areas may explain this nonadditivity, but further research is needed to determine the specific cause of this phenomenon. Nicotinic receptor mechanisms in the limbic system play an important role in cognitive impairment for a variety of neurological disorders, including Alzheimer’s disease and schizophrenia. Alzheimer’s disease results in a dramatic decrease in hippocampal nicotinic receptor density, affecting α4β2 receptor expression most prominently. In schizophrenia, there are anomalies in α7 nicotinic receptor expression, which seem to be crucial for the cognitive impairment of the disorder. 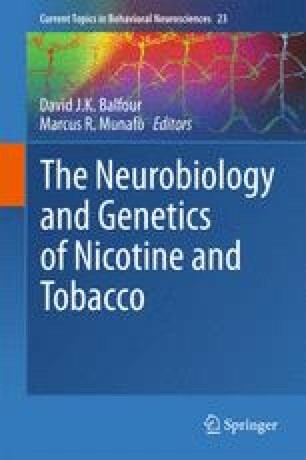 Chronic nicotine exposure, such as seen with tobacco use, results in an increase in nicotinic receptor density in the limbic system. This effect appears to be related to the desensitization of nicotinic receptors seen after agonist application. Open questions remain concerning the role of desensitization versus activation of nicotinic receptors in cognitive improvement. Funding for these studies was from: NIDA, NIMH, NSF, Alzheimer’s Association, Abbott Pharmaceuticals, AstraZeneca Pharmaceuticals, Targacept Pharmaceuticals, and an unrestricted grant from Philip Morris-USA.